To volunteer is a noble thing, but to impact the culture of an organization is truly remarkable. 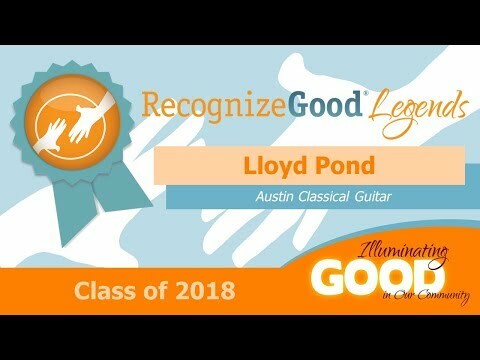 That’s exactly what volunteer Lloyd Pond has done at Austin Classical Guitar (ACG). While he’s dedicated thousands of volunteer hours with the organization and saved the group tens of thousands of dollars, anyone who’s spent time with him will tell you that his largest impact isn’t measured in either of those categories. Can a volunteer really change an organization? By all accounts, Lloyd has done just that. Austin Classical Guitar launched in 1990, and since then has become the largest nonprofit organization of its kind in America. Along with bringing artists – both established and emerging – to Austin for its concert series, ACG builds and supports classroom-based guitar education programs that currently reach more than 4,000 students in over 60 local schools. Part of their work involves maintaining the guitars used by students, and repairs can be both painstaking and expensive. But, as development director James Fidlon says, Lloyd is up for the challenge – he estimates Lloyd (a passionate amateur musician himself) has repaired at least 300 guitars. Repairs are just part of what Lloyd does for ACG. He also does all kinds of minor and major maintenance chores around the office – painting, hanging pictures, vacuuming, setting up tables for board meetings, taking out the trash, assembling things like desk lamps and watering plants. Additionally, he not only goes shopping for events and for office supplies, but for years has loaded his trunk with office recycling to take it to a dumpster down the road.